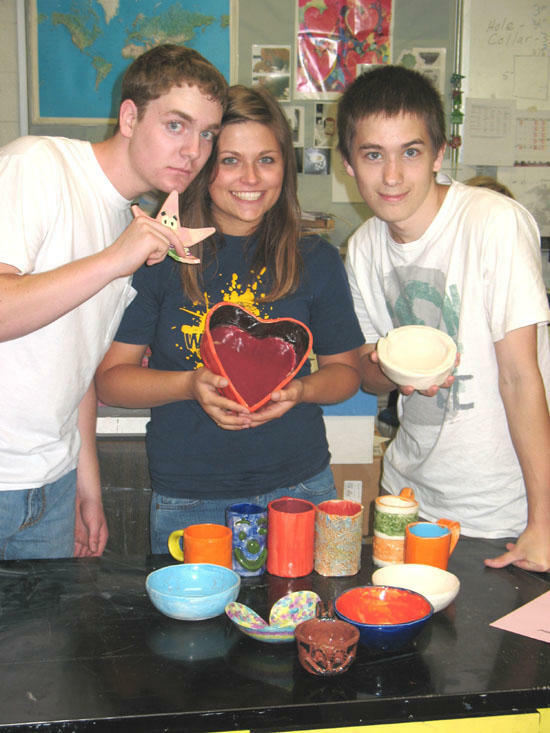 The pottery students are (from left to right) Dustin Ward, Tamra Stembridge, & Andrew Hinson. The Pottery students at Cannon County High School will be hosting a “Bowl” supper at this year’s Relay for Life event on Friday May 21 to help raise money for cancer awareness in Cannon County. The pottery students made bowls and cups for this event that you can buy and eat out of. It will be held at Dillon Park with live entertainment, food and refreshments, and also a children’s activities center. There will also be entertainment from the following High School bands. “Pete & Fred.”“ JRB”, Erica Melton, Clay Young and Andrew Bullock will be performing. In the children’s area will have an assortment of activities for kids plus they can decorate their own ceramic bowl pr cup. These will have to be picked up at a later time. The tickets are $8.00. If you don’t get one before hand from a pottery student, you can buy one at the park. All proceeds go to the American Cancer Society for the fight against cancer. The 5th and 6th period pottery classes are trying to raise as much as they can for this worthy cause and would like to see everyone there!